Machined aluminum backup sights mount at a 45° offset angle to enable instant transition from primary optic simply by tilting the rifle. Rear sight mounts on receiver rail, front sight on handguard top rail. 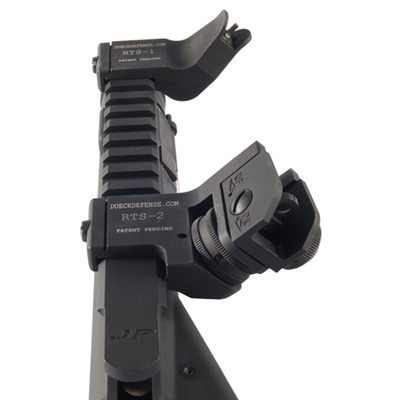 Mounts on right side of receiver for right hand shooters, and eliminates the need to co-witness backup sights through your optic. Provides the same bore height and sight picture as standard USGI A2 sights. A2-style rear sight has flip-up long- and short-range apertures, and is adjustable for windage and elevation in ½ MOA clicks. Locking bar and crossbolt attachment system clamps securely to MIL-STD 1913 Picatinny rails and sits only .20" above the rail, so there’s no interference with the main sighting system. Front sight base won’t interfere with the beam path of military IR laser/illuminators. No special tools needed; installs using a slot tip screwdriver. Available in left hand for left hand shooters by special order. SPECS: 7075 aluminum, hardcoat anodized, black. Front – 1 3⁄8" (3.5cm) long, 3" (7.6cm) wide. 3.1 oz. (88g) weight. Rear – 1" (2.5cm) long, 2¾" (7cm) wide. 1.5 oz. (43g) weight.